The Texas Senate voted to give charter schools state money to build facilities, with a caveat: traditional public schools get a little extra, too. 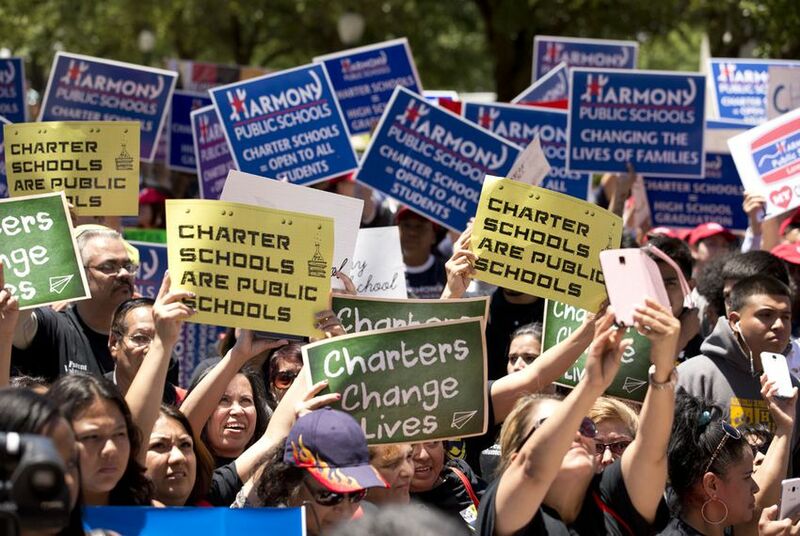 The Texas Senate on Thursday voted to give public charter schools state money to build facilities — a day after the governor joined thousands of charter students, parents, educators and activists in a rally on the Capitol steps. Charter school advocates have been asking the state for facilities funding so they do not have to dip into operating costs to expand their schools. As passed in a 20-10 vote, Sen. Donna Campbell's Senate Bill 457 would give $50 million to charter schools to subsidize their growth over two years — a major decrease from the original proposal of just above $400 million. Critics argue that charter schools already receive more money per student than larger urban school districts that are also growing quickly, and should not get additional state funds. The House Public Education Committee is expected to vote on a companion bill in the coming weeks. Sen. Kirk Watson, D-Austin, successfully changed the bill to cut its total funding from $400 million to $100 million, and to require that half that amount go to traditional public schools. His amendments easily passed. "Every dollar we're able to provide to schools for facilities is one less dollar schools need to raise from property taxes," he said. Christine Isettt, a spokeswoman for the Texas Charter Schools Association, called the vote "historic," because it was the first time either chamber had moved to fund charter facilities. "We understand that there's a tight budget climate; we understand the fiscal realities of working within that climate," she said. Campbell, R-New Braunfels, said the large number of students on charter school waitlists shows a demand that is not currently being met. "We were willing to do it because anything is better than nothing to make a good start," she said, about the lowered funding. "With those amendments, we strengthened the bill." She said the Texas Education Agency would have to come up with a process that charter schools would go through to apply for the facilities funding. Fast-growing traditional public schools would probably not see the money attached to this bill — because their property values are too high for them to qualify. "Even with Sen. Watson's amendments attached to the bill ... the majority of fast-growth districts receiving no facilities funding from the state will not change," said Guy Sconzo, executive director of the Fast Growth School Coalition, a group of 75 school districts seeing the quickest enrollment growth in Texas. "Know that we will continue to work in the House to keep any charter facilities funding from seeing the light of day." At Wednesday's charter school rally, Gov. Greg Abbott said, "Every child has a right to attend the school that is right for them." Lt. Gov. Dan Patrick said he would fight for charter facilities funding as members from both chambers negotiate on the state budget. Charter schools, seeking more state money, want the public to know that they're public schools, too. In a preliminary vote, the House approved Rep. Dan Huberty's bill to inject $1.6 billion into public schools and simplify complicated funding formulas. Legislators must still take a final vote on the bill.